Ratified in 1788, the United States Constitution was built upon the ideals of justice, liberty, and prosperity. However, women were not explicitly promised equal protection or rights by the Constitution until 1920, when the 19th Amendment guaranteed the right to vote for all citizens regardless of gender. On Friday, September 12th The Constitutional Sources Project (ConSource), The Institute for Constitutional History at the New-York Historical Society and the George Washington University Law School hosted US Supreme Court Justice Ruth Bader Ginsberg for a discussion on the evolution of the Constitution to include rights for women, and highlighted what still must be done for women to have full equality in the US. Justice Ginsberg has sat on the Supreme Court for 21 years – three of which she was the only female justice – and has consistently upheld her established reputation as a fierce advocate for women’s rights and civil liberties. Justice Ginsberg’s commitment to addressing the importance and right of women’s political participation is shaped by personal experiences. From being one of nine women out of 500 students in her 1956 Harvard Law School class to facing blatant job discrimination, she understands the challenges that women have faced to participating in government in the US over the last 60 years and still today worldwide. 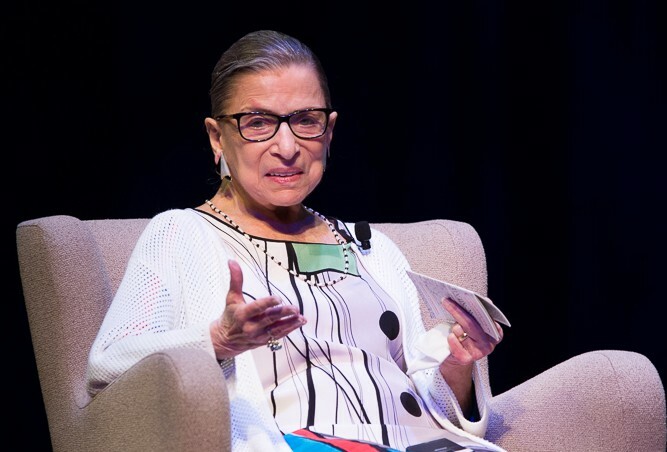 Although she recognized the progress that has been made in women’s equality since the middle of the 20th century – there are now two other female justices who sit on the US Supreme Court with her, Justices Sonia Sotomayor and Elena Kagan – Justice Ginsberg argued that more must be done. During the discussion, she advocated for a definitive statement in US law for women’s full citizenship, which would not only support gender equality but also hold legitimacy equal to the American value of freedom of speech. One possible enactment would be the full ratification and adoption of the Equal Rights Amendment, which would prohibit any form of discrimination based on gender. This amendment came close to becoming law in the 1970s, but it failed to be ratified by the necessary amount of states and since then has remained only a hope. Justice Ginsberg pointed to several landmark court cases that have both paved the way for and hindered women’s rights progress. She brought up the recent controversial decision in Burwell v. Hobby Lobby, in which the Supreme Court ruled that employers have the right to deny employees coverage of contraception if this conflicts with the employer’s religious beliefs. Justice Ginsberg wrote an extensive dissent to this majority ruling, mentioning that Congress should correct the issue through legislation; current political gridlock on the issue makes this unlikely.